This dance cardio workout is so much fun! 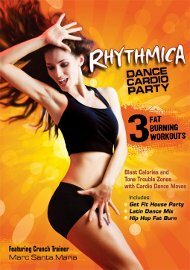 Each dance routine has a Latin vibe, while providing a lot of variety and burning mega calories. The DVD Includes 3 exciting 20 minute dance workouts. You ll feel like you re in a nightclub instead of your home. Latin Dance Mix Rooted in Latin dance basics, this segment takes the user through an international dance party routine. Hip Hop Fat Burn You ll burn calories and tone up while doing your favorite old school hip-hop party moves. I you like Zumba, you will love this!